Although sleep apnea can occur in anyone, there is a high prevalence in those who are overweight. The American College of Physicians has established new guidelines for lifestyle modifications, which includes losing weight to treat sleep apnea. Research shows losing just 10% of your body weight can have a significant improvement in your sleep apnea symptoms. In some cases, those who are obese can cure it by maintaining a healthy weight. Yoga is a popular holistic treatment for both your mind and body. It is well-known for improving your quality of life by reducing stress levels, but it can also positively impact your sleep quality as well. Specific poses for relaxation and alleviation, like Cat-Cow and Seated Twist, can help to enhance your breathing when living with sleep apnea. It helps to strengthen and tone the muscles in the upper airways while also minimizing daily stress. Humidifiers play a key role in the treatment of sleep apnea because they help to reduce dryness and discomfort, particularly for those who use a CPAP machine. Dry air can make it difficult to breathe because your nasal passages and throat lose moisture. This can make it feel as though there is an obstruction. A humidifier adds moisture to the air to prevent the atmosphere from drying out. Although it will not cure sleep apnea, it does make it easier to breathe easier. Your sleep position does impact how well you rest throughout the night. If you tend to sleep on your back with your arms by your side, it may cause you to snore. It can also disrupt blood flow to your brain, face, and neck. Although it may be comfortable, this position is not a good choice if you have sleep apnea. Instead, it is better to sleep on your side. Home remedies are beneficial for managing the condition, but they are no substitute for the treatment you receive from your dentist in Southlake. If you are not using an appropriate treatment to manage your condition, do not wait. 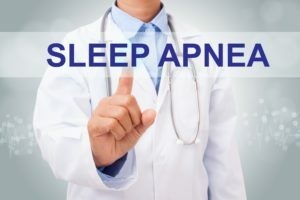 Contact your dentist for sleep apnea therapy. Dr. Preetha Thomas strives to improve her patients’ quality of life through biocompatible services. Besides general dentistry, she also offers areas of specialty care, including sleep apnea therapy. Contact our office today to schedule your consultation for treatment.